← I Am In Seattle! 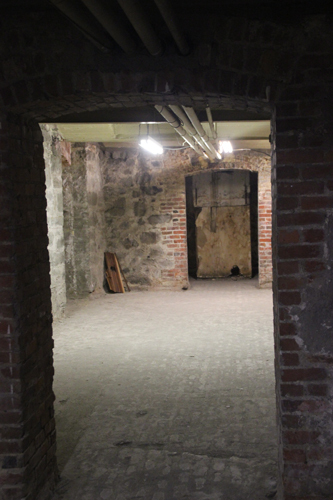 There are two tours that lead people though the underground streets of Seattle. Bill Speidel has the most famous one that is in all the guidebooks, Seattle Underground. 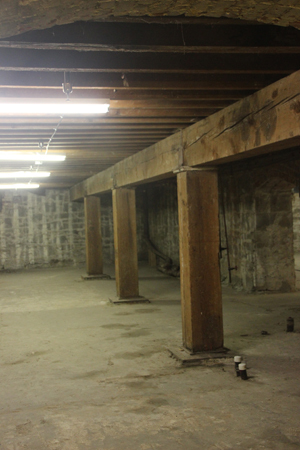 There is a new company called Beneath the Streets and I took that tour yesterday. I took notes but I didn’t write down our friendly tour guide’s name, so I’m going to call him Bill. I hope that’s not confusing. Bill took us to a masonry pylon underground that is featured in an historic photo of the area before the underground was underground. 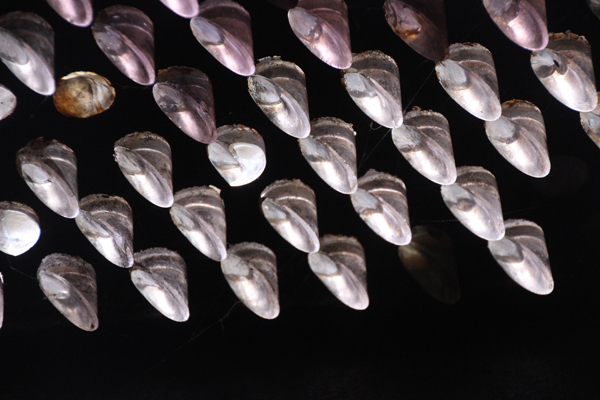 Topside, he said, a copper column marks the same spot. 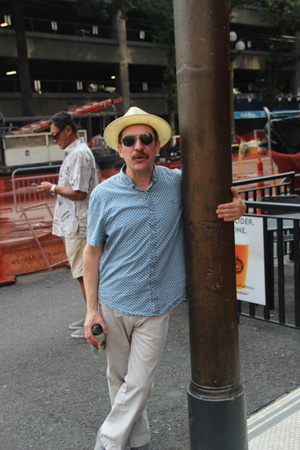 Our lively and informative tour guide hugs a copper column attached to a pylon underground. The US government provided land grants for this part of the Washington territory in 1850. The plan was to get a European-American settlement up and running to have a pretext to claim the land before England did, which is was poised to do. The US government was unconcerned about the people who already lived in the area and had for 5,000 years, the Doowamish tribe. Settlers imagined coming out and farming. They arrived to find a steep hilly terrain covered with majestic evergreen trees. So they switched to logging. The hills were too steep to navigate easily, so the business part of town was built, basically, on the beach. High tide frequently flooded businesses. Roads were graded out of dirt, and, well, have I mentioned that it rains frequently in Seattle? Between the high tides and the rain, the streets were mud. Despite this, the town rumbled along, cutting down trees, milling them at Yesler’s Mill and selling them. In 1889 a massive fire destroyed the business district. The city fathers, such as they were, wanted to rebuild immediately (some came back days after the fire, pitched tents, and tried to reopen). Engineers offered an alternative; using massive water-cannon, they would erode away or “regrade” the surrounding hills, creating a gentler slope, and use the dirt to raise the downtown area. They saw a chance to correct the earlier design flaw and they were eager to try it. 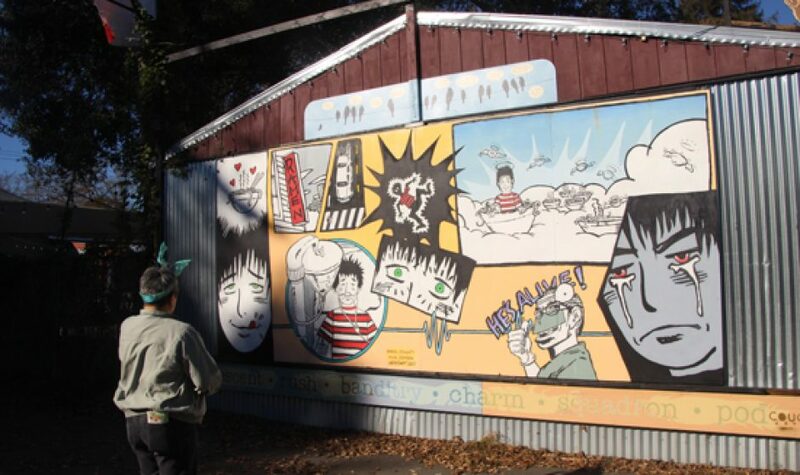 The town fathers thought that was cool, too, until they heard that it would probably take ten years. A compromise was reached. The business people would rebuild and open. In addition, they would build huge retaining walls, fifteen feet high in some spots, around each block in a grid pattern. When that was done, the regrading would begin, and the dirt would be directed between the retaining walls. “Picture a waffle,” said our guide. Eventually, when it was done, people would build a new building on top of the old “first story” one. 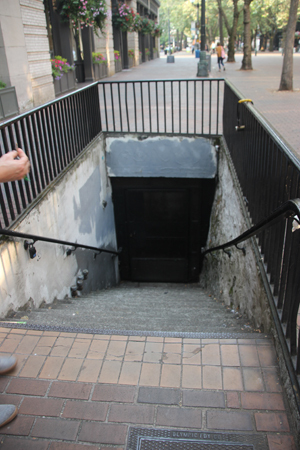 A set of stairs to the underground. For about ten years, the streets of downtown Seattle were about twenty feet higher than the sidewalks. While, miraculously, no one was killed in the catastrophic fire, plenty of people died in those ten years from falling off the street. That’s not a cause of death you hear every day. 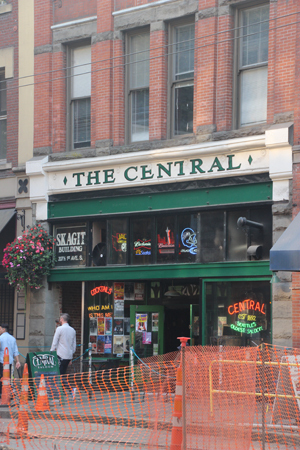 The Central, a dive bar famous for hosting Nirvana. One really cool thing about the underground are the glass skylights. From topside they look like utility covers, studded with clear, milky and amethyst colored disks. Those disks are the bases of glass prisms, that let light into the “underground” story. 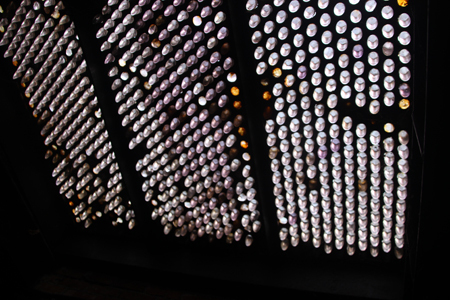 These glass dots are prisms, bringing in the light from up top. I sized this next picture a little bigger. Sorry about the blur, I didn’t want to use flash. Bill has lived in town twenty years, and he had lots more to say. The group was small– there were three of us– and I think we got a lot more detail, and more of Bill’s personal history, than many groups do. It was fun, and it makes me want to go reread Cherie Priest’s Boneshaker right now. This entry was posted in View from the Road. Bookmark the permalink.